Jeff Lynne wasn’t really planning to tour the Electric Light Orchestra again until Chris Evans persuaded and badgered him into headlining the Radio 2 Hyde Park gig in 2014 almost 30 years after they had last toured. I’m sure he can afford to buy his own, but a lot of people owe Evans a pint for that (but maybe not after they’ve shelled out £5.50 each for one here!, come on Wembley, be fair!!). After that triumphant gig which re-invigorated Jeff’s creative juices he soon got to writing and recording 2015’s When I Was a Boy album. And here we all are tonight, practically salivating at the prospect of witnessing this genius at work. 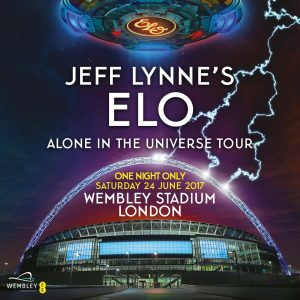 Wembley is full, and with the giant ELO UFO lighting up above the stage the sold out crowd erupts when the opening strains of Standin’ In The Rain kick in. A perfect, dramatic opener which immediately showcases the string section. Jeff looks pretty much the same as he has done since the early 70’s with perhaps a slightly smaller afro and leads his twelve piece band into Evil Woman. All Over The World and Showdown follow and provide us with more perfectly composed masterpieces to sing along with. The classic Living Thing is up next with some superb strings from cellists Amy Langley and Jess Cox, and violin from Amy’s sister Rosie. For most bands, songs of this calibre would need to be saved for the encore. Not Jeff, he’s got more than he knows what to do with. With over 50 singles and countless fan favorite album tracks tucked away in the bulging ELO back catalogue he could probably play here every day for a week with a different setlist each night and still leave us begging for more (perhaps next year Jeff?). When I Was a Boy is cheered on and sung along to like one of the oldies, before a reminder that Jeff was one of the Travelling Wilburys when the band knock out a great version of Handle With Care. Personal favourites were the disco soaked Shine A Little Love and Last Train to London from 1979’s Discovery album. But it’s really hard to single one track out over another with the ubiquitous quality that Lynne has kept to such a high standard over his career. A well known perfectionist (he plays all the instruments on the recording of the latest album) Jeff clearly puts as much effort into making sure the live sound is as flawless as it is in the studio, and his band are a credit to this ethos tonight. Backing vocalist Melanie Lewis-McDonald is a shining example of this on her outstanding operatic Soprano on Rockaria. Can’t Get It Out Of My Head gives everyone a chance to illuminate the stadium with their smart phones. Not that it needs lighting up much more. A full six giant screen video backdrop, two massive monitors, the giant UFO and some mightily impressive pyrotechnics give us plenty to look at this evening. Jeff is his down to earth self effacing self and seems just as in awe of the whole spectacle himself at times. After a seemingly endless stream of hits the set can only close with one song. Mr Blue Sky is awesome, complete with blue skies and fluffy clouds floating on the video screens and the dramatic instrumental ending complete with the vocoded “please turn me over” ( the song was the last track on side 3 of the double Out of the Blue album ). Jeff says his thank you’s, him the band all come and do a bow for us and then disappear. There’s a heap of songs left that could be played in the encore, but we get a stretched out, rocked out Roll Over Beethoven to send us all home with beaming smiles and a hunger for just one more….